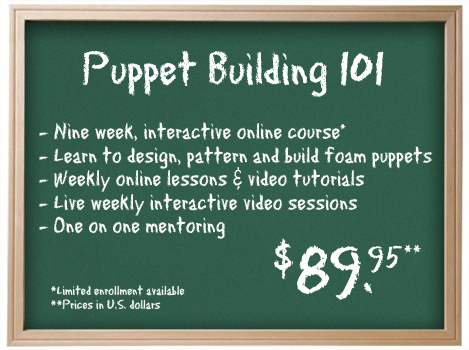 Puppet Building 101 is a nine-week video course on building foam puppets. Over the duration of the course, students will receive video tutorials and handouts that take them step-by-step through the puppet making process. There are also going to be live video chats to answer question that may arise. The course will be taught by Andrew, who is the founder of PuppetBuilding.com and PuppetVison blog, and has been building puppets and teaching puppet building for a long time. What I particularly like about it is that we’ll be shown how to make our own patterns based on what we want to make. I think while it’s good to follow patterns and make puppets, it’s even better to know why the patterns are the way they are. Am I signing up for this? Yeah, of course I secured myself a spot first, haha. That sounds fun. I can’t wait for you to post photos of your assignments! I’m happy to see more creative people (who are not affiliated with universities) developing courses on the web. This is definitely a positive direction! Yep, I most likely will post them.